New York, NY – October 16, 2015 -Ballet Hispanico, celebrating 45 years of sharing and reflecting the diversity of Latino cultures through dance, announced the grand opening of Ballet Hispanico at the Arnhold Center & the Ford Foundation Lobby on Tuesday, October 13, 2015 at 167 W. 89th Street. 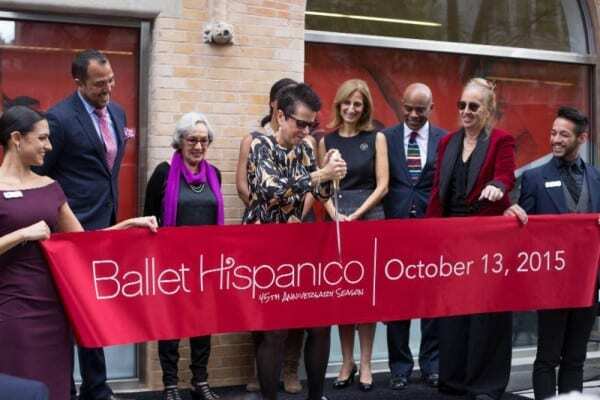 The ceremony highlighted the recent renovation of Ballet Hispanico’s longtime home, with a Ribbon Cutting Ceremony followed by a tour and reception. Kate Lear, Chair of the Board of Directors of Ballet Hispanico, welcomed the crowd and introduced speakers, including Gale A. Brewer, Manhattan Borough President, City of New York; Lee Koonce, Executive Director, Ballet Hispanico; Eduardo Vilaro, Artistic Director, Ballet Hispanico; Margaret Morton, Program Office, Creativity & Free Expression, Ford Foundation; and Jody Gottfried Arnhold, Member & Honorary Chair of the Board of Directors of Ballet Hispanico. Notable attendees included: Vin Cipolla; Diana DiMenna; Tom Finkelpearl; Joan Finkelstein; Norman Lear; Sharon Luckman; Christina McInerney; and Nancy Ticotin, among others. Following the ceremonial ribbon cutting, attendees enjoyed a champagne toast, hors d’oeuvres and a special performance featuring young dancers from Ballet Hispanico’s School of Dance. The facades of Ballet Hispanico’s two historic carriage houses were restored and redesigned to give new life and improve accessibility to the building. Newly opened doors and windows, now with glass, welcome the community and enable passersby to see School of Dance classes. A complete refresh of the lobby, featuring interactive digital displays and historical photos, now enhances the impact of Ballet Hispanico’s artistic home. SUK Design Group supervised the restoration of the façade and redesigned the layout of the first floor. Interior designer Carolyn Wharton, senior principal at Deborah Berke Partners, designed the lobby and reception furniture. A grant from the Ford Foundation allowed for the lobby make-over and technology improvements, including three large digital displays that will greet visitors and students. Additional funding from the Ford Foundation funded other projects and bolstered the organization’s reserve. A major gift from the Arnhold family celebrates Jody Gottfried Arnhold’s 30 years on the Board of Ballet Hispanico, 16 of those years in the role of Board Chair. “Under the artistic leadership of Eduardo Vilaro, Ballet Hispanico continues to thrive, and the new Arnhold Center and Ford Foundation Lobby embody the strength of his artistic vision over the past six years. We are looking forward to an exciting autumn and beyond,” said Lee Koonce, Ballet Hispanico’s Executive Director. This fall, Ballet Hispanico is featured in the inaugural Great American Dance film seriesalong with the San Francisco Ballet, Alvin Ailey American Dance Theater, and New York City Ballet. On Thursday, November 12, 2015 at 7pm (local time), over 600 U.S. cinemas will screen Ballet Hispanico’s CARMEN.maquia and Club Havana. The event will also include a special behind-the-scenes look at the company’s rehearsals and dancers. In addition, Ballet Hispanico makes its annual holiday return to the Apollo Theater in Harlem with an expanded New York Fall Season from November 20-21, 2015. Highlights of the season include the World Premiere of an evening-length work by Brazilian choreographer Fernando Melo set to live music, and Saturday en Familia, a special matinee for families featuring fun Ballet Hispanico repertory favorites. The company continues to tour nationally and internationally and will return to The Joyce Theater in April 2016 for its New York Spring Season. Shopping & Prosecco for Happy Hearts Fund!